ROLPA, May 24: With the second round of local level elections just around the corner, the election fever has gripped remote villages of Rolpa. The government has scheduled June 14 as the election date for provinces 1, 2, 5 and 7. So, the locals are found widely engaged in political rallies and campaigns as to promote the parties and the candidates. Rallies and musical instruments have become equally popular in rural areas as well. Farmers, laborers, businessmen and intellectuals are busy talking about elections. The facilities and promises made by the prospective candidates have attracted the locals toward the poll campaigns. 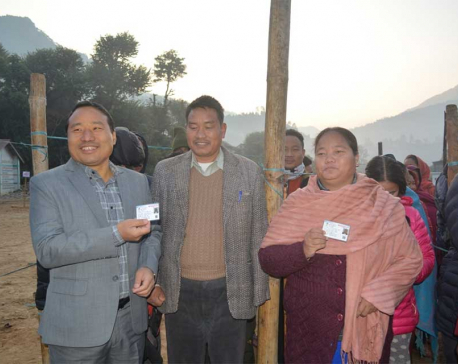 Though Netral Bikram Chand-led CPN Maoist has threatened to foil the elections, the locals of his village Kebari of Iribang are actively participating in the poll campaigns. The village which is 26 km far from the district headquarters is all set for elections. Seventy-one-year old Irkha Lal Budha of Iribang- 2 is desperate to take part in the elections. But he is disappointed that no one has yet taught him how and where to cast vote. “I will be soon taking part in elections but no one has taught me how to cast vote and whom to cast vote,” Irkha Lal laments. Local level elections announced after a gap of 19 years has grabbed the attention of many youths as well. Many locals have shown their disappointment toward the distance of rural municipality centers. Despite that, they are hopeful that the second round of elections will be as peaceful and systematic as the first one. According to Hari Prasad KC, a local leader of Nepali Congress, locals of Iribang are eager to cast votes but they are worried if Netra Bikram Chand-led CPN Maoist will create any obstacles. Locals of remote villages lament that they have been deprived of various facilities. Even after so many years of human civilization, there is no telephone facility in Mirul village. There is no television and radio. Children are unable to go to schools in absence of bridges to cross the rivers. So, the locals are planning to vote for the candidates who give top priority to these infrastructures. Locals of remote villages of Rolpa are counting days to take part in the local level elections.